This entry was posted on Sunday, May 1st, 2011 by Frances Ryan. 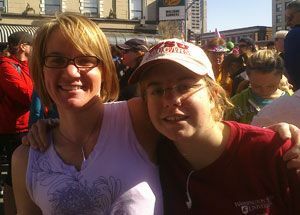 Bloomsday 2011 is over and I’m alive to tell the story! And after little-to-no training, that is a success in itself. Yay! 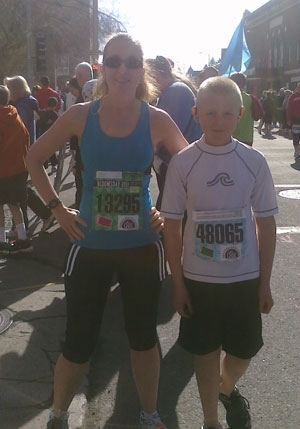 Haden and I ran the entire race. All of it. We ran it all. I really thought that Haden would take a walk break at some point. But, no, he was good to run! And he ran up Doomsday Hill at a rather impressive rate. In fact, once we got to the top of the dreaded hill, Haden was set to finish at a great speed. So, he dashed off in front of me just shy of mile seven and I didn’t see him until I made it past the finish line. I was (and still am!) extremely pleased and impressed with his ability! The other good stuff is that the rest of our group (the five walkers) all completed the course in one piece. Of course, the cool thing about that is that they’re not athletes and have never walked such a distance in their lives. A couple had recently done five miles, and the other three had walked (sometimes with a bit of jogging) 5Ks a couple of times. So this really was a challenge for them and they are all filled with joy and pride at their accomplishments—as they should be! And for even more good stuff: New connections were made! My sister and my neighbour really hit it off and it seems everyone enjoyed each other’s company and everyone just had an all-around good time, which is always a treat! Sadly, there was one instance of the race that upset me. As I was running (slowly) up Doomsday Hill, I was passed by a woman around my age who was probably carrying about 20 pounds more that her frame allowed—wearing spandex shorts and a rather small running top. She wasn’t going much faster than me, but she was making pretty good time. Well, just as I got up to a group of three extremely pretty ‘they’re probably in a sorority’ girls, I overheard them speaking rather disparagingly about the woman and all the jiggling extra bits of her. They were very vocal about how ‘people who look like that’ shouldn’t be allowed to dress like that. Now, if that were me, I don’t think I’d have chosen that wardrobe. And if she were in the grocery store, I’d have probably been a little snarky (inwardly, mind you) about her choice of clothing. But she was running a 12K road race. Running it. And she was keeping a better pace than me or the silly commentary panel. If that’s the outfit she felt comfortable running in, I say wear it! Now, what you really want are photos and times. Sadly, at nearly 10 p.m. the times aren’t yet posted and I am too beat to wait for them. I will update you on those tomorrow. In the mean time, I guess the photos will have to suffice. Awesome. All of you. Simply awesome!